Notice the subtle use of pink? 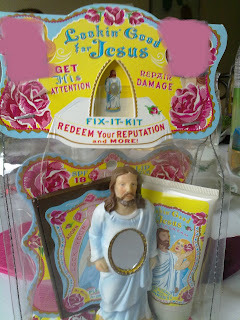 One of my father's friends once brought this from the U.S.
Jesus has a small mirror on his belly. The set includes this mirror-Jesus, a creme (hand creme, I think) and something brown I don't remember. The blurred rosy parts are pictures of the friend who bought it (they were tacked onto the set for no reason I can imagine). I especially like the line "Get HIS attention". How? By looking good for him, of course. That is how you get a guy's attention, ladies. Now, Benjamin Radford, what do you think? Is this set intended for girls/women or boys/men? And why?